The most famous Golem legend (“The Golem of Prague”), written down at some point in the 16th century, is a classic precursor to Frankenstein. Though each are just kicking up some Promethean dust, both are moralistic works that intone against tampering with forces beyond nature, particularly with the creation of life. It seems appropriate, then, that Paul Wegener’s 1920 take on the legend would stylistically and thematically prefigure Universal’s Frankenstein film that would arrive 11 years later. The Golem is more than just an intriguing antecedent, though, as it also stands as one of cinema’s most impressive monoliths of German Expressionism, the style that would eventually be imported by James Whale for his landmark adaptation. As an exercise in pure style and atmosphere, The Golem itself is one of our best fantasy-tinged horrors, as it’s a film that plays out like a dark fairy tale. Admidst a stunning starry backdrop, Rabbi Loew (Albert Steinrück) foresees trouble for the local Jewish community. After presenting his warnings of disaster to the community, his prediction in confirmed when the Holy Roman Emperor Luhois (Otto Gebühr) issues a decree forcing the Jews to empty their ghetto by the end of the month. The decree sends Loew scouring through his occult knowledge in an attempt to protect his community from persecution. He ends up constructing a giant, clay golem that he brings to life. Initially, it serves an assistant and even accompanies its creator to an annual festival before a series of events conspire to turn it against its master and its people. With a film that cements his place as one of the early masters of cinema, Wegener transports his audience to another time and place with an elaborate, lavish production that’s rich in design and texture and lined with typical Expressionist signposts: the elevated, almost labyrinthine sets, the sharp angles, the lush, shadowy photography. The film economically conveys its divide between the affluent Emperor’s gilded palace and the destitute Jews, who are stuffed away in a cramped, earthy ghetto; even more tucked away is Rabbi Loew, who conducts his business in a secret chamber, where he’s bathed in an ominous green light that hints at the eeriness yet to come. Karl Freund is a pivotal figure here as the film’s cinematographer, and he would go on to photograph other definitive Expressionist works like The Last Laugh and Metropolis before bringing his style to Hollywood. While he worked on Dracula after emigrating to America, there’s little doubt that his contributions influenced Frankenstein cinematographer Arthur Edeson, whose work reveals the clear influence of the style. Here, Freund’s striking contrasts reflect the fractured society that’s here divided among religious and poverty lines; though rabbi Loew might be the Golem’s surrogate father, this environment spurs its creation. Within this incredible, almost otherworldly production, Wegener buries a deceptively simple morality play that actually hinges on deception and misunderstanding. While The Golem might be a monster movie at its heart, it's a kaleidoscopic mix of romance, drama, and fantasy for much of its running time. Wegener’s plotting is somewhat unconventional, as a subplot involving the rabbi’s daughter and the emperor’s messenger (Lyda Salmonova & Lothar Müthel) operates in the background until their forbidden love instigates the film’s most overt horror sequence in the Golem’s destruction of the ghetto. Even though the creature’s turn is foretold by the stars, it doesn’t actually happen until this misunderstood love provides the impetus. Unlike many tales of this nature, the rabbi isn’t condemned out of hand for creating life; instead, he’s a hero to both Jews and gentiles when his creation saves the day at one of the emperor’s gatherings. It isn’t until the rabbi’s assistant (Ernst Deutsch) wrongly employs the Golem for his own petty purposes that it’s turned into a monster. A plot turn that finds him stumbling upon the rabbi’s daughter with this stranger sounds like the stuff of tawdry soap operas, but it speaks to the very disturbing horror of societal divide resting at the center of The Golem. This love is forbidden, of course, because it involves a Jew and a non-Jew, and it’s interesting to note that both sides are rather complicit; one could just as easily imagine the emperor himself having the same sort of reaction if he had been the one to stumble into the room. After all, he fired the first shot with his attempt to evict the Jews before the rabbi worked towards a reconciliation with his creation in tow; in the hands of a good man like the rabbi, the golem is molded into a symbol of hope and cooperation. In the hands of the assistant, blinded by xenophobic rage, it becomes a monstrous instrument of destruction; as the Golem is clay, it can only be shaped by the hand that’s guiding it, so it almost becomes a malleable totem that ultimately represents mankind’s propensity for paranoia, persecution, and self-destruction. All of this coalesces into a visual form during the film’s most famous scene that sees the corrupted Golem running roughshod through the ghetto. With a staggering sequence that’s teeming with masses of extras and brilliant effects work, Wegener paints a horrific picture of chaos, as the ghetto is bathed in a fiery, hellish glow. It feels like a precursor to monster movies both big and small, as the creature not only sends hordes of masses fleeing in panic, but also focuses its sights on the rabbi’s daughter, whom he carries off in his arms like so many of his later monstrous counterparts would do. That the Jews themselves are somewhat responsible for their own destruction leads to some interesting readings; while the whole sequence plays like some sort of divine retribution for invoking heavenly forces in the first place, it’s difficult to ignore the Golem’s complex impressionability. He actually serves his initial purpose (of defense) quite well before he’s invoked in a more malicious manner; as always, it’s not the monster that’s most monstrous--and, in this case, the monster only acts as a reflection of our darker impulses anyway. Wegener himself plays the Golem, and he’s appropriately robotic and without expression, a lumbering lump of clay given human form. The stoic nature of the performance is a fine reflection of the creature as a blank slate--it is what you make it, essentially, and there is, ultimately, a somewhat optimistic notion that the Golem can be contained and even humanized. It's a misunderstood creature that’s only truly disarmed in the presence of a child in a scene that’s obviously reminiscent of its famous counterpart in Frankenstein (and which would be visually echoed again in Ghost of Frankenstein); in this case, though, the little girl manages to unwittingly thwart the now docile Golem, a moment that perhaps indicates that mankind need only to confront its monsters with true innocence to conquer them. Whereas the adults in the film have projected all of their fears, anxiety, and hatred onto the Golem, this girl simply offers kindness. If the Golem is merely a reflection of mankind, then it also has the capacity for goodness. Because of this, The Golem is a much more optimistic tale than Frankenstein, but it’s still difficult to ignore the obvious similarities. Rabbi Loew feels like an early example of a cinematic mad scientist as he toils away in his secret lair. His creation of the Golem is almost Faustian and ethereal, as spirits and demons are conjured up in one of the film’s more memorable scenes. Like Whale’s Henry Frankenstein, Loew even has a Fritz-like assistant who is ultimately responsible for fouling up the whole enterprise. If The Golem prefigures Whale’s film, it’s like a loose ancestor in terms of style and themes; tonally, Wegener’s film is much more blithe, particularly in its resolution. Sometimes, The Golem only feels like an incidental horror movie since its scarier sequences arrive in calculated bursts. 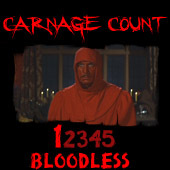 Taken as a whole, the film is more folklore than a pure campfire story, but it’s a classic condemnation of hubris and folly all the same. In many ways, this film acts like a fugue that presents the various possibilities for The Golem; it can be both an instrument for good and evil, something Wegener had already explored in two previous films. 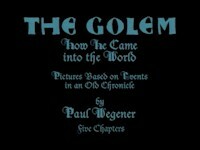 The original 1915 film, The Golem, finds the title character resurrected in modern times before embarking on a killing spree after being spurned by a woman, while The Golem and the Dancer was a comedy sequel, meaning the 1920 film actually functions as a prequel to those two (thus the subtitle, How He Came into This World). Unfortunately, the other two films are now lost, so we can only speculate about the rest of Wegener’s vision for this legend. While I suppose one film is better than none, it’s certainly a little disappointing that we might be missing out on a fantastic trilogy. Instead, we’re left with this sole film, which stands as one of the most important films of the silent era. Masterfully and intricately produced and rich with thematic heft, The Golem would be a landmark even if it didn’t influence other notable films down the line. Kino Video restored the film to its proper glory on their DVD release, which also features an excerpt of Julien Duvivier’s 1936 pseudo-sequel Le Golem, a gallery of photographs and artwork, and scene comparisons featuring excerpts from other films and books. Beautiful, evocative, and haunting, The Golem rests somewhere between the stuff of dreams and nightmares. Essential!